in the context of crop productivity. Their main points are summarized as follows. Developing countries will be affected most for three reasons: (i) climate change will have its most negative effects in tropical and subtropical regions; (ii) most of the predicted population growth to 2030 will occur in the developing world (United Nations Population Division DoEaSA, 2009); and (iii) more than half of the overall work force in the developing world is involved in agriculture (FAO, 2005). While anthropogenic effects on climate have been apparent for several decades, modelling future climate change is not an exact science due to the complexity and incomplete understanding of atmospheric processes. 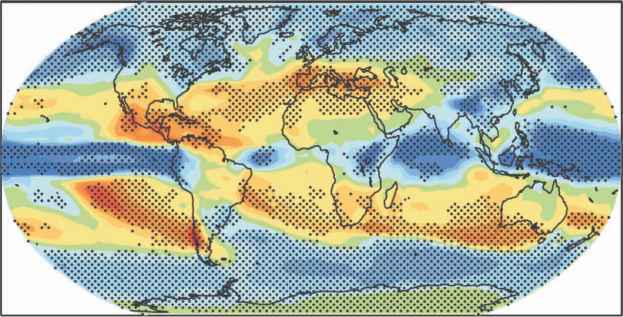 None the less, there is broad agreement that, in addition to increased temperatures (see Plate 1), climate change will bring about regionally dependent increases or decreases in rainfall (see Plate 2), an increase in cloud cover and increases in sea level. Extreme climate events will also increase in intensity or frequency, such as higher maximum temperatures, more intense precipitation events, increased risk and duration of drought, and increased peak wind intensities of cyclones. Predictions in sea level rise indicate that this will continue for centuries after temperatures stabilize, causing flooding of coastal lands and salini-zation of soils and subsurface water in coastal regions. • The yield potential of staple foods will decline in most production environments and commodity prices will rise. • While projections for a few countries with northerly latitudes indicate net positive impacts of climate change, projections for most developing countries are negative. • Only 'best-case' scenarios predict no net effect of climate change on global cereal yields by 2030 but predictions beyond that time frame are much more pessimistic. On a more positive note, Lobell and Burke (Chapter 3) also state that an important factor in terms of maintaining productivity in the face of climate change will be the way farmers adapt their cropping systems: for example by diversifying when faced by increased risk, or by adopting new technologies derived from centrally planned efforts, such as cultivars bred to resist biotic and abiotic stresses as well as improved and more sustainable cropping practices that permit the genetic potential of new cultivars to be realized. These issues are addressed in subsequent chapters.